The spirit of San Diego's annual Comic-Con has always been playful, so it's not surprising that the final clues of a long scavenger hunt led a group of avid Avenger fans to a quirky endpoint. After hours of searching, 300 dedicated attendees were led into the United Artist 14 Theater. As the lights dimmed, a familiar face popped up on the screen. "I am coming to you live from a bathroom stall in Wilmington, North Carolina," quipped Robert Downey Jr., who was, indeed, seated on a toilet. "Where I am prepping to shoot the very famous toilet escape sequence from Iron Man 3." Though no such toilet escape exists, that didn't stop the Comic-Con group from laughing and clapping with delight. Downey, whose career has been on a constant upward trajectory since the release of the first Iron Man film in 2008, managed to capture the perfect mix of enthusiasm and humor befitting his porcelain perch. Briefly recapping the events of the Iron Man tie-in film The Avengers, this spring's big-budget comic book adaptation, Downey reminded fans that a very important plot point remained to be tied. What was that story strand's fate? 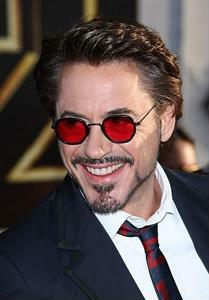 "So I'll let you see it for yourself," said Downey. "This exclusive short film directed by my dear friend and Marvel [Comics] co-president - isn't that synchronistic - Louis D'Esposito." Downey's announcement was quickly followed by an 11-minute short film detailing an epilogue to The Avengers, in which a young New York couple stumbles across an alien weapon of astounding power. The film, which stars Lizzy Caplan and Jesse Bradford, will get a wide release on the upcoming Avengers Blu-Ray. But the question remains - why a toilet? Was it Downey's particular brand of irreverence or a particular love of bathroom lighting fixtures and vanity cabinets? More likely than not, it was a sound mixing issue. When you're making cinema-shaking announcements about one of the biggest (and already most successful) franchises in film history, you want to be sure your fans can hear you. And thankfully they did - not that Downey's or Marvel's assured success at the movies is in any danger. With combined domestic box office takes of over $600,000,000, according to Box Office Mojo, the past two Iron Man movies have secured future films - especially considering The Avengers broke six million all on its own. With star power like that, Downey's not getting flushed any time soon.